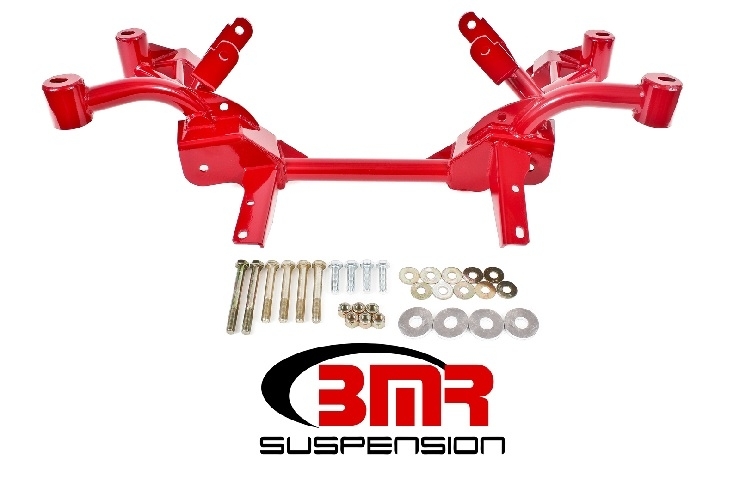 BMR Tubular K-members reduce weight while providing more room for large tube headers and turbo systems. The factory K-member weighs 54.5 lbs. with motor mounts. Our tubular version with integrated motor mounts only weighs 24 lbs., a weight savings of 30.5 lbs! Combine this with a set of our Tubular A-arms and save up to 50 lbs. off the front end! Made from .120" wall 1.5" DOM tubing and laser cut, CNC formed 3/16" mounting plates. NOTE: Manual rack and pinion conversion loses an additional 28-36 lbs. NOTE: Not for use with OE A-arms. FREE SHIPPING AT BRUTE SPEED!